Yesterday I had my first pumpkin spice latte of the season. I couldn't be more excited for crisp mornings that call for extra blankets, long sleeves, scarves, and the onset of the oranges, golds and reds of fall. There are autumn flavors and colors everywhere in my New Hampshire locale and I love it. Along with the pumpkins comes a new morning routine: pick a scarf/cowl/shawl or hat then pick the outfit to match it. I certainly have no shortage of neckwear to choose from, so for now I'm sticking with the lighter weight designs. It is, after all, still reaching the low 70's in the afternoon. Earlier this week Sheep Heid by Kate Davies, knit by a friend of CEY in MountainTop Vail, was making its way around the office for the traditional oohs, ahhs and petting. It's a lovely fair isle cap. 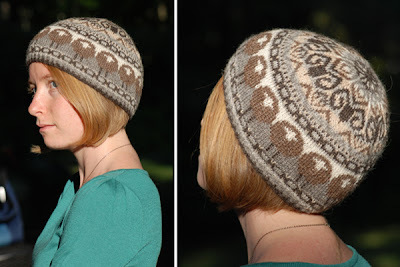 Fair isle – what a wonderful use of the yarn, one that had never occurred to me. 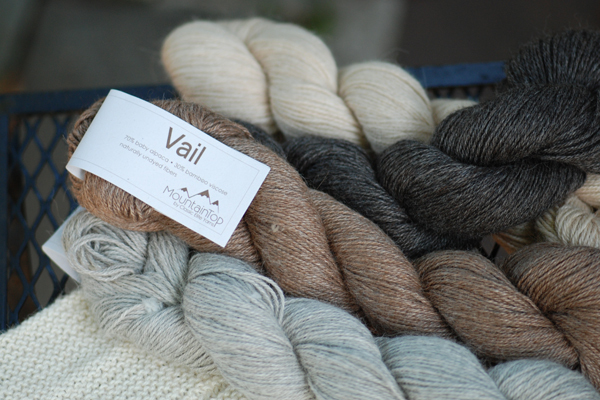 Vail is a bamboo/alpaca blend available in eight undyed shades. 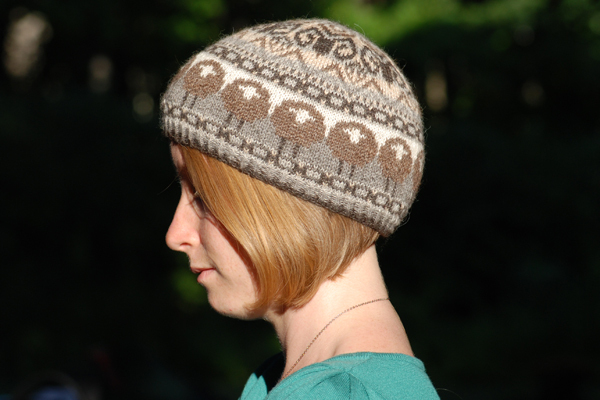 It's wonderfully lightweight and the natural colors work perfectly with the sheep motifs in the cap. So much yarn and so little time is my mantra and Vail is one yarn I haven't had the chance to meet. Sheep Heid would be a quick and satisfying way to meet the yarn. However, I'm a neck accessory kind of lady and I've found myself smitten with garter stitch stripes (along with the online knitting masses, it would seem!). 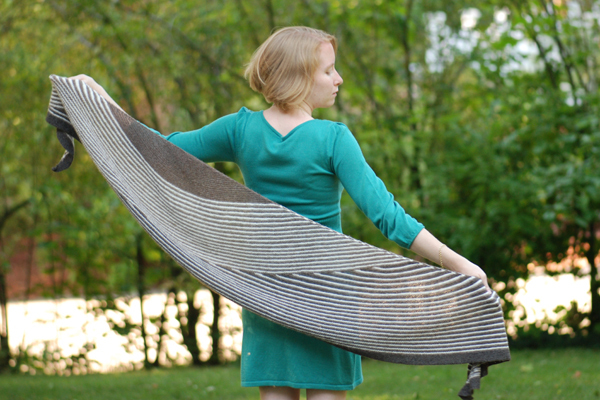 I finished my Stripie Scarf in no time and have been wanting to cast on a similar project. A knitterly friend recently finished Color Affection, once again in Vail, and also came by to share her FO. Color Affection seems like just the thing to satisfy my craving for garter stripes in a lightweight fall accessory. By the way, I even wore handknit mittens for a few moments this morning. It didn't last long, there will be plenty of time for them soon enough. Surely I'm not the only one, are you pretending it's cold enough for handknit accessories too? In 1984 Kristin Nicholas first joined Classic Elite Yarns as the Creative Director. Having since developed her own yarn and written multiple books, Kristin now lives and blogs in Western Massachusetts. 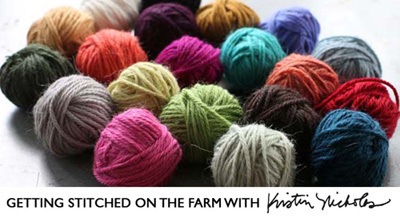 We were thrilled when Kristin took the time to talk to us about her early days at CEY, life on the farm and the changes since her first foray into the knitting world. CEY: What's it like to be back at Classic Elite? I know there are some familiar faces here from your first position with the company. Kristin Nicholas: Oh, it is so nice to be back working with many familiar people. Although there have been many changes in staff and I must say quite a bit of growth since I last worked at CEY in the early 2000’s, I feel so many things are the same. CEY is still a bunch of very hard-working women (and Jim Doyle, my old friend and the “token male”) who have passion for the yarn business, for fibers, for yarn, and for color. My beloved old office is now housing the University of Lowell but as a company, CEY still stands for beautiful yarns in beautiful fiber blends and awesome colors with a creative presentation. 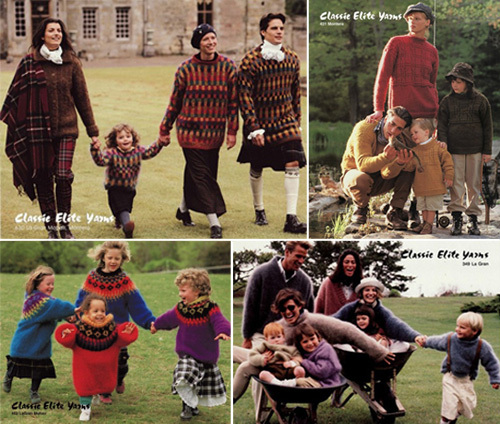 You were a big part of building the Classic Elite Yarns brand during your time as creative director. What was your vision for the company? I joined Classic Elite in 1984 – at the height of a big knitting boom. I was 25 years old and just married. I was hired to take a company that specialized in handweaving yarns and bring it into the handknitting marketplace. CEY didn’t have many yarns that were suitable for handknitting. I chose to acquire yarns that would be perfect for handknitters – many of them chunky and quick to knit. I knew that we had to have good patterns and a large, fun color range in each yarn in order to lure in the knitters and develop a following. I also wanted to create a family/lifestyle feeling to the company and did this by featuring kids and adult women and men in our pattern collections photographing the designs in lovely locations so that knitters would want to BE the person in the image. I always made sure there was a mix of very easy designs and more complex and “aspirational” designs. A few of Kristin's patterns from the CEY archives, available on Patternfish.com. How do you see the brand's evolution since then? I left CEY shortly before the latest crazy (good crazy, not bad crazy) boom in knitting. When I left, knitting was still in the doldrums and everything business-wise was always a struggle. Our daughter Julia was turning two and she had many health complications. Personally, leaving CEY was a big decision but family comes first and I could no longer keep up the creative demands of the job and stay sane. I have watched from the outside in as new yarns and product ranges have been added. I worked so hard to develop the brand and now I see CEY as one of the leaders in the yarn biz. It’s nice to see something I started carry on and blossom – sort of like raising a kid! I like the fact that the company is still owned by a woman who understands the yarn business and the passion that knitters have. It is nice that when CEY changed hands when Pat Chew, the woman who I worked for passed away, that it didn’t go to some big corporate giant that ruined all that I worked so hard for. Big corporations often ruin companies they buy. CEY remains independent and woman-owned and able to pick up on trends and run with them on a moment’s notice. Describe Color by Kristin in three words or less. 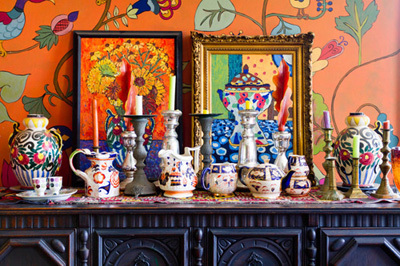 Your personal style is very eclectic, colorful and worldly. How did you cultivate that style? I grew up around handmade textiles – my grandmother was from Germany and she was an amazing needleworker – crochet, quilting, and embroidery (no knitting!). My mom fostered my interest in making things and always kept me stocked with good fabrics for my sewing projects and embroidery kits and threads. When I went to university I majored in Textiles and Clothing and I discovered ethnic textiles at small import shops (you could probably call them hippie stores). I was so drawn to the handmade stitches and colors in those kinds of products and identified with the makers in foreign lands. Over the years, I have remained interested in handmade fabrics and things from around the world. I collect them and study them through books. I like to have handmade textiles around me whether I made them or someone from a foreign land made them. They just make me happy and although I don’t have the time nor the finances to travel the world, I feel like the colorful textiles I collect help me see the world in that way. Your last yarn, Julia, was your baby (in name AND in fiber), and now you have Color by Kristin. Describe the process of developing your own yarn. The 50% wool gives CBK stability, sturdiness, and bounce back resilience. 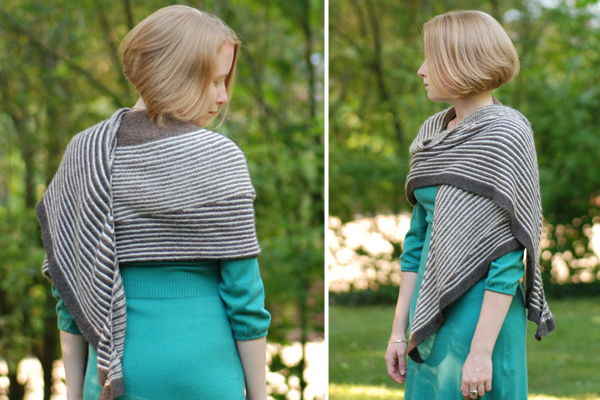 The 25% alpaca gives CBK its softness and lovely drape. The 25% mohair gives CBK its shine and awesome deep and lustrous color. It is a 3 ply yarn so it starts with a single yarn that is softly twisted. Three singles are twisted together to create the worsted weight yarn. CBK isn’t overly spun so it has great drape. It is a gorgeous yarn that is a little confusing to knitters. It looks plain and basic in the skein but then you knit with it and it flies off the needles smoothly and sturdily. It looks great in textured stitches like cables and is gorgeous for Fair Isle (two color knitting). A lot of my work is decorated with embroidery and it is so nice and smooth that it just glides through the knitted fabric. It also felts gorgeously and I love a good felting yarn. How have you seen the knitting world change since you started, in terms of the demographic and the aesthetic? When I began in the yarn biz it was always about the sweater – picking out the design and then making it. Now I feel like it is more about the process for many knitters, the joy of making something just for the creativity of using your own hands. I’m not sure I’m correct about this but I think that is why small projects like socks and hats and mittens have become so popular. As far as the aesthetic goes, it is all over the map now and things that wouldn’t have been commercially viable years ago now are. 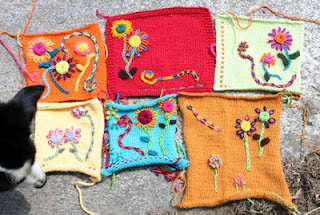 I’m just finishing up a book on knit and crochet sunflowers. I never could have sold that idea 25 years ago! 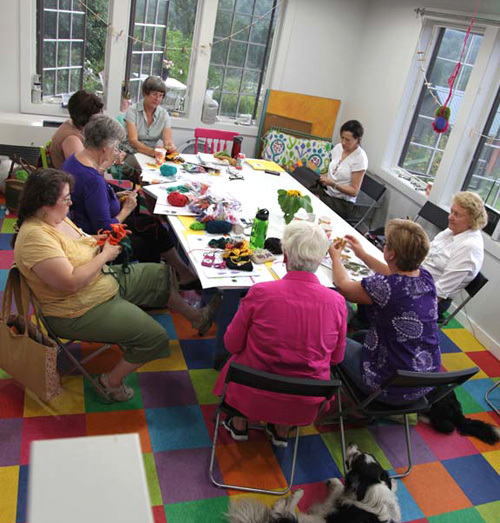 I think yarn shops serve a great purpose in the communities that support them. Owning a yarn shop is a lot of work and most of the owners don’t make that much money. That is still the same as it was back in the 80’s. But the fellowship that develops among the customers and shop owners is still the same. They depend on each other and I am thankful that so many yarn shops keep on going and supporting the creative arts, especially in these challenging times. When I began, cashmere wasn’t available commonly as a handknitting yarn. Now it is. Otherwise yarn spinning is pretty much the same as it was back then. Once in a while a new fiber will come out that everyone thinks will be revolutionary (like milk, soy, tencel) but then production problems happen and the “new” thing isn’t as great as it was touted to be and everyone goes back to the classics of wool, alpaca, mohair, cotton, and angora. When did you start blogging? How has it changed your business? I started my blog “Getting Stitched on the Farm” back in March of 2006. I was living out here in western Massachusetts far from my friends and family. I began the blog to share my family’s somewhat peculiar life on a working sheep farm. 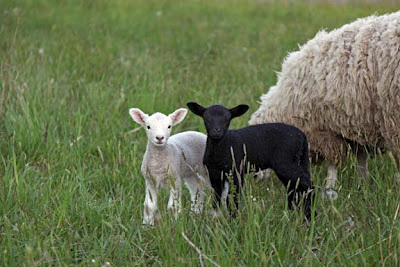 The blog has become a great platform for me to share my designs, my love of color, and our honest to goodness sheep farm where there is a lot of life and death. It has changed my “business” for the better – by giving me the opportunity to speak from my heart and whoever is interested can listen or not. If you ever had told me ten years ago if I would be selling patterns via the ether and knowing people I haven’t ever met personally, I never would have believed you. It just blows my mind (but in a good way)! How do you decide what colors to put together in your designs? I knit and swatch everything before I write a pattern. It happens in the swatch and if it is wrong, I change it and re-knit. I have to see it physically to know it is correct. I intuitively have a feeling but I always like to be sure by swatching! What advice would you give a knitter (like me) who's afraid of colorwork? Just do it! Get over your fear and give it a go. It isn’t hard and there will be initial stumbling points but what’s wrong with that. Try to loosen up and breathe. Carry your floats looser than you think you should. If there is a typical day at Leyden Glen, what does it look like? Coffee first. Julia heads to school and Mark heads out to check on the sheep that are grazing in about five different locations right now. I feed the chickens and sometimes get a walk in with the dogs. Then it is a matter of looking at the to-do list and working through the most urgent issues first. Deadlines drive me – whether it is a farmers market and pricing our lamb or a book or pattern deadline. And always the blog a few times a week. I look forward to blogging and writing about what I am interested in and working on at the moment. It isn’t very exciting – just like any job – attending to responsibilities and making things happen hopefully. I always cook dinner and the three of eat together every night. I read every night before bed and not e-books, paper books because I don’t have an e-reader. I like to turn pages. 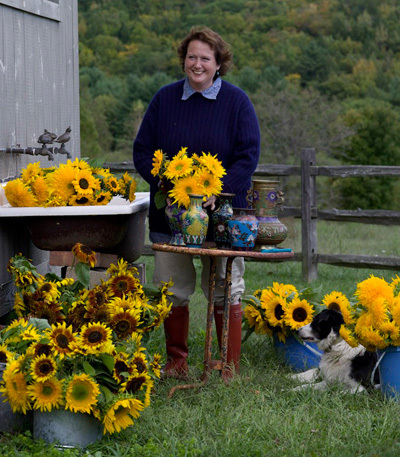 For more information, visit Kristin's Website and Getting Stitched on the Farm, where Kristin actively blogs about her day-to-day life on Leyden Glen Farm. 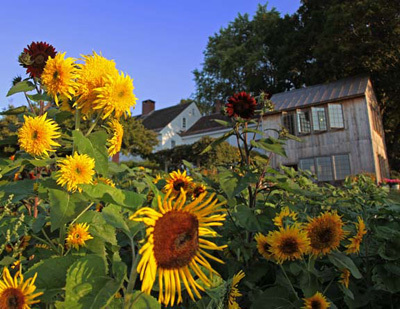 Information about Leyden Glen Farm can be found at LeydenGlenLamb.com. 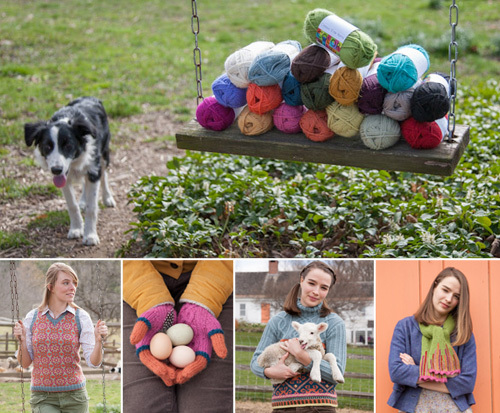 Kristin's yarn, Color by Kristin is featured in two new collections of designs, Book One and Book Two, both published by Classic Elite Yarns and available at Local Yarn Shops. To browse Kristin's patterns from the CEY archive, click here to visit Patternfish.com.